Very gasgas na the line "a way to a man's heart is through his stomach". I think for married ladies, it has to be "a key to a lasting marriage is cooking his eggs creatively". Oh, relax lang. As in pagkain ito mga mothers ha. Hihi. My soldier is not that pihikan but he if he has a choice, he chooses talaga. Like, he'd rather have simple fried tilapia than sweet & sour tilapia. Or he dips fried talong in soy sauce with calamansi instead of in bagoong alamang. And he loves dishes that are smothered with butter and/or cheese. 1. Whisk the eggs in a bowl. Don't overdo it kasi we're not doing scrambled eggs naman. We really do not want it fluffy. Season it with salt & pepper. I added a bit of ground oregano. 2. Fry the cubed potatoes first in kawali with cooking oil. I don't have a non-stick pan so it was a challenge for me to create a well-cooked omelette. Look at the photo above, half lang. Kasi yung half nyan, wasak. Hehe. Set aside the fried cubed potatoes. 3. Put the butter in the kawali. 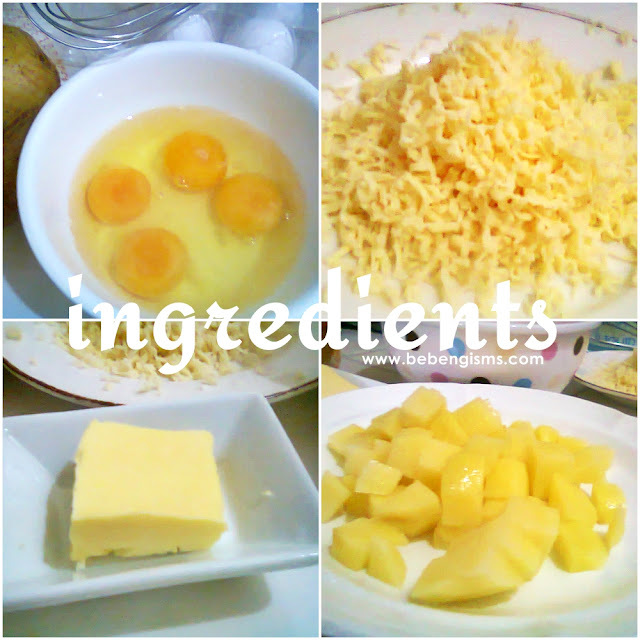 Always remember to add a teaspoon of oil para hindi masunog ang butter. 4. Pour in the eggs in the kawali. Make sure na sakop nito ang all possible spaces ng circumference of the kawali. So tilt it slightly. 5. Put the fried cubed potatoes. Then quickly add the grated cheese on the same side of the potatoes. Medyo magmadali ka, dahil bukod sa gutom na asawa mo at ang mga bata, baka maluto na ang egg hanggang sa ibabaw. So better talaga 'pag prepared na lahat ng ingredients before cooking. Para mukhang cooking show ni Nigella Lawson ang peg. Chos. 6. 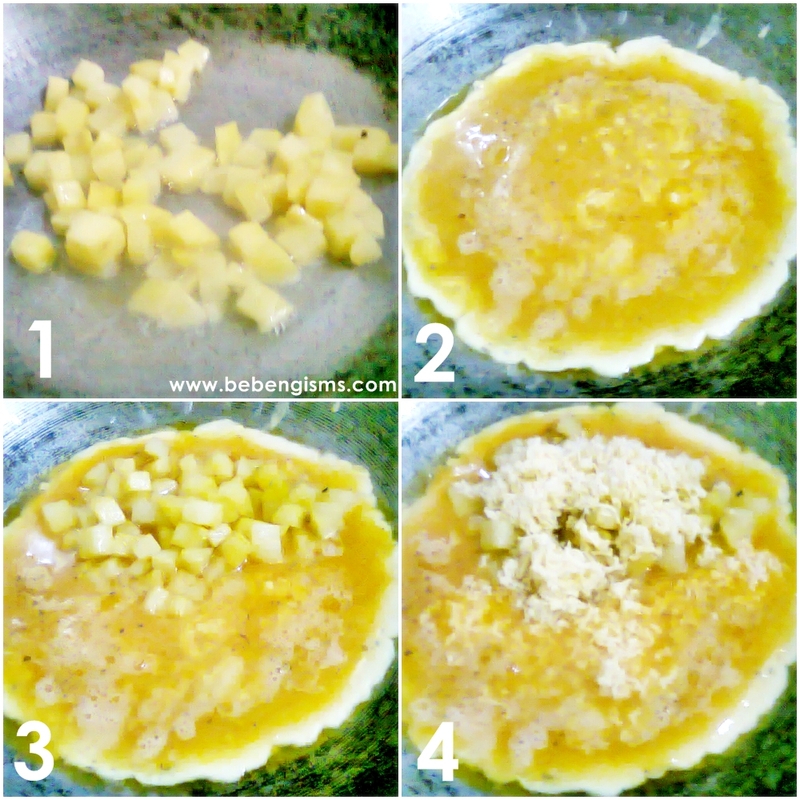 Tapos using a spatula or sanse, fold the egg. Basta, takpan mo yung side na may potato and cheese. I'm not a recipe-writer talaga, anuber. 8. For the potato fries, siyempre fry it, as usual. Then put it in a canister or anything na may takip. Kasi you will make alog that one with a dash of cumin, ground basil and salt. Hiluhin mo sila together. 9. Plate it and serve. Perfect with sinangag and the one you love. Charot. Looks yummy! We also just made something like this but without the cheese. We might give this a try next week. If I have a left over in the fridge I tried to experiment it. Just put all the left over like corned beef, canned tuna and many more then beat an egg. Presto I do have my omelet. Hmmnn, I have never tried that combo, I might tough because it looks very tasty. I wonder i the little one will like cheese omelette, I shall try it one of these days..
haha. nakakatuwa naman ang kwento mo. nakakarelate ako. 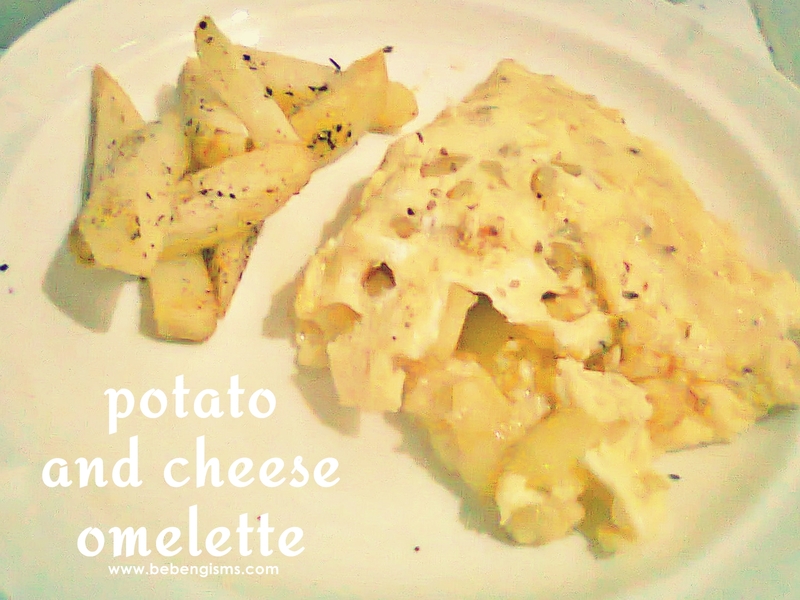 now, i know what's missing in my omelet -the cheese! para cheesy ang bossing sa araw-araw. I love eggs for breakfast and this is something I would eat.